I am SO on board with the whole multi-tasking skincare/makeup movement that’s going on right now. Call it the cool girl look or millennial makeup or whatever you want – I’m calling it a dream come true. Right before my trip to NYC I got the chance to check out a new player on that particular stage, Onomie Beauty. 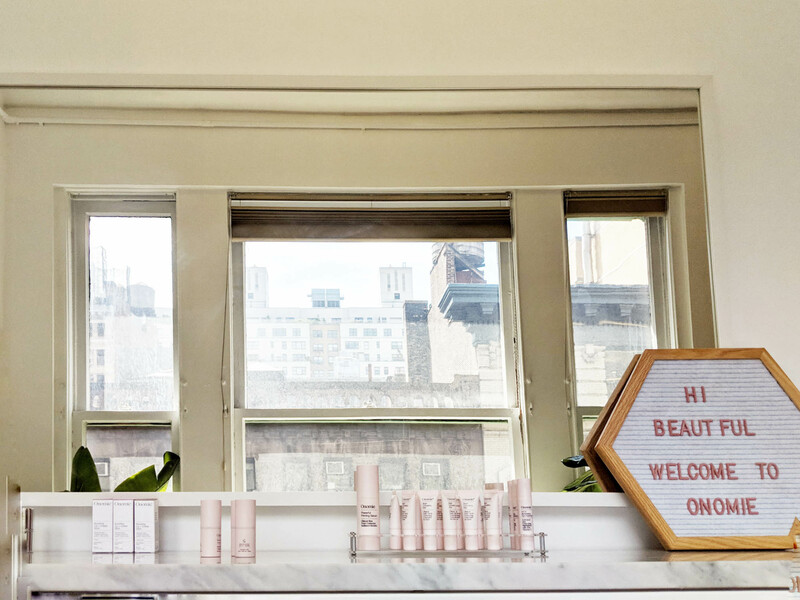 They make a curated line of products that roll makeup and skincare into one. Refreshingly, all the products are scientifically-formulated – no anti-chemical scaremongering here! 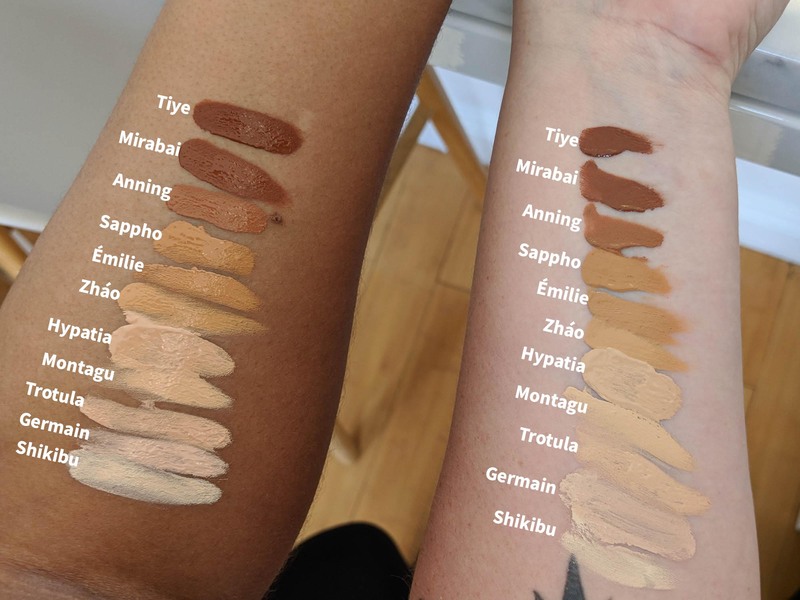 I also adore the fact that their product shades are all named after women in history. 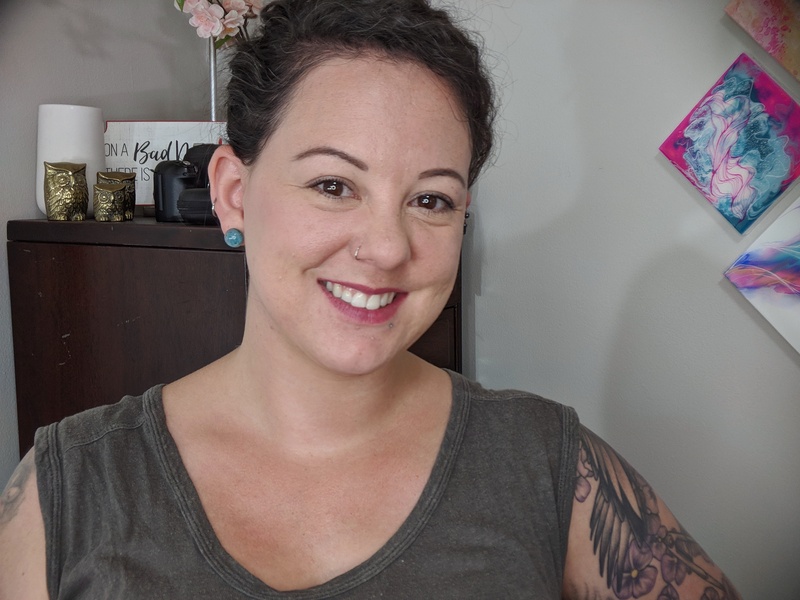 They sent me a few of their products to try out and spoiler alert: they’re now staples in my daily routine. They have a showroom in New York where you can check out the full line, and you also get 15% off while you’re there. It’s rare that I get the opportunity to leisurely swatch a brand’s entire product line, so I couldn’t pass up the opportunity! My friend Kara went with me and kindly donated her arm so you can see the shade range on different skin tones. 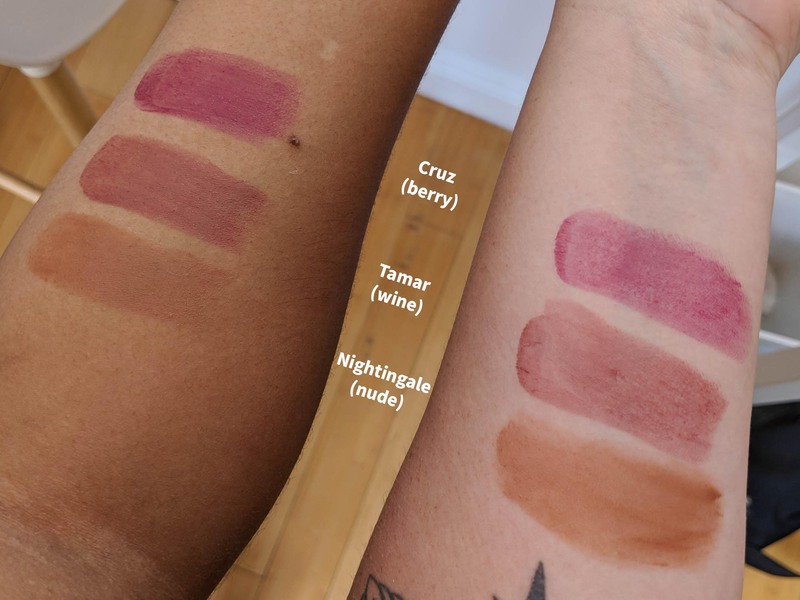 For foundation color reference: in MAC shades, Kara (on the left in the photos) is around NC42 – NC44, and I’m somewhere between NW20 – NW25. The ACE Illuminating treatment is my favorite of the whole bunch. I got it in Lovelace (the pink color) and it’s perfect for brightening up around my eyes even when I’m not wearing makeup. Just patting it around the outside of my eyes & brow bone instantly makes my eyes look brighter. It’s also great on my cheekbones as a liquid highlight. It’s very subtle, but that’s usually what I’m going for – especially in the summer when I’m trying to be less shiny. Unlike some liquid highlights, it doesn’t have a greasy feeling. Even better, it’s loaded up with vitamins A, C & E (hence the name), so it actually improves skin tone & texture over time. The tiniest bit goes a long way with this stuff, so use sparingly! About half a pump is all I need for both eyes, maybe slightly more if I’m using it on my cheekbones too. For hiding pesky dark circles, this stuff is my new holy grail – it’s like a concealer and eye cream in one. It keeps my skin hydrated – no easy task in the under eye area – and doesn’t gather in creases at all. It’s got a thin, light texture and spreads easily. And the ingredient list! Caffeine to reduce puffiness, vitamin C to reduce fine lines, night sleeper to promote circulation, ginseng to reduce inflammaton – swoon-worthy. The color range is also really decent with eleven shades to choose from. 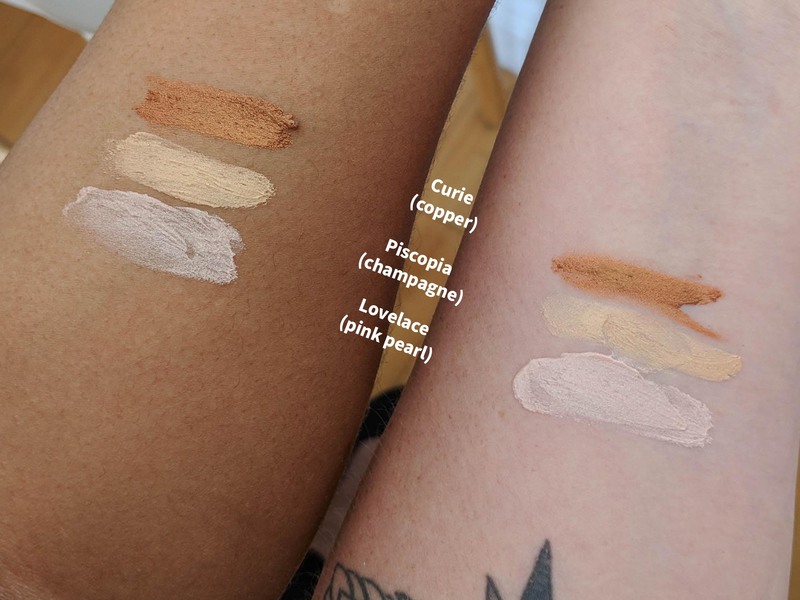 I use Germain (the second lightest) since I like my under eye concealer to be a bit lighter than my skin tone; I could probably go one shade darker if I really wanted to. One thing to note about the Concealing Elixir is this: it’s not meant to be a high-coverage concealer. 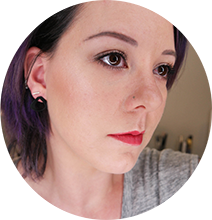 I tried using over blemishes just for funsies, and a little redness still peeked through. I would love to see them do a thicker, high coverage version in the future because I think they’d hit it out of the park. I’ll admit it – when I first swatched this primer I was not at all sure I’d like it. A shiny liquid plus shimmer particles? So not my thing. But I gave it a shot anyway, and learned that it sets to a velvety finish that blurs lines and pores. The shimmers suspended in the primer are incredibly fine, which creates a radiant effect. Definitely not the glitter-face I was afraid of. I think this is a great all-purpose primer – it doesn’t control oil, but it’s also not drying. It just gives a nice, even canvas for applying foundation. For no-makeup days, it gives your natural skin just a little bit of extra oomph. 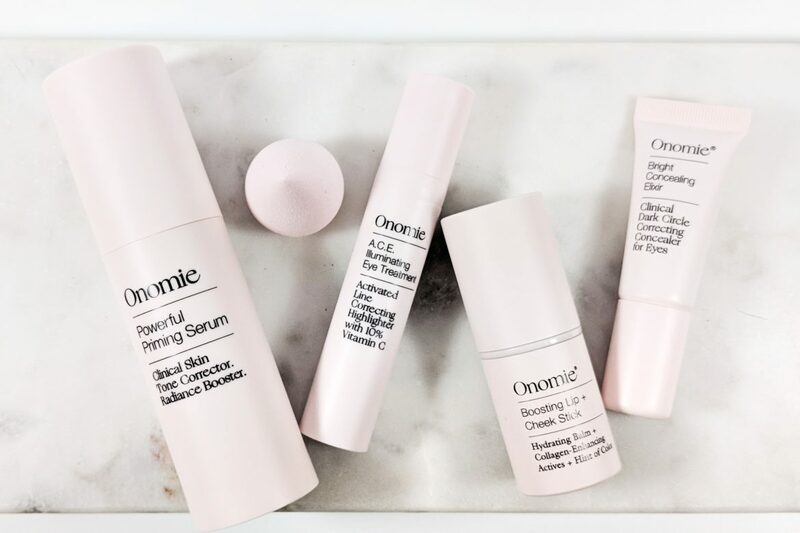 Like the other products in Onomie’s line, the primer is also packed full of ingredients like willow bark extract and vitamin C that help your skin look its best. Aren’t these colors so pretty? Stick blushes are great for summer – they’ll stick to my skin even without foundation and don’t get all patchy if I sweat. A lot of lip/cheek combos I’ve tried in the past didn’t actually work well for both, but this one delivers. A tiny dab on the cheeks is plenty to give a healthy glow. Once it’s there, it’s easy to blend and makes it through a work day easily. To use it as a lip color, I prefer to use a brush so I can be a little more precise. The color is very buildable, doesn’t sink into lines and is SO much more comfortable than any other lip/cheek stick I’ve tried so far. It doesn’t last as long on my lips as my cheeks, but it does leave a nice stain. 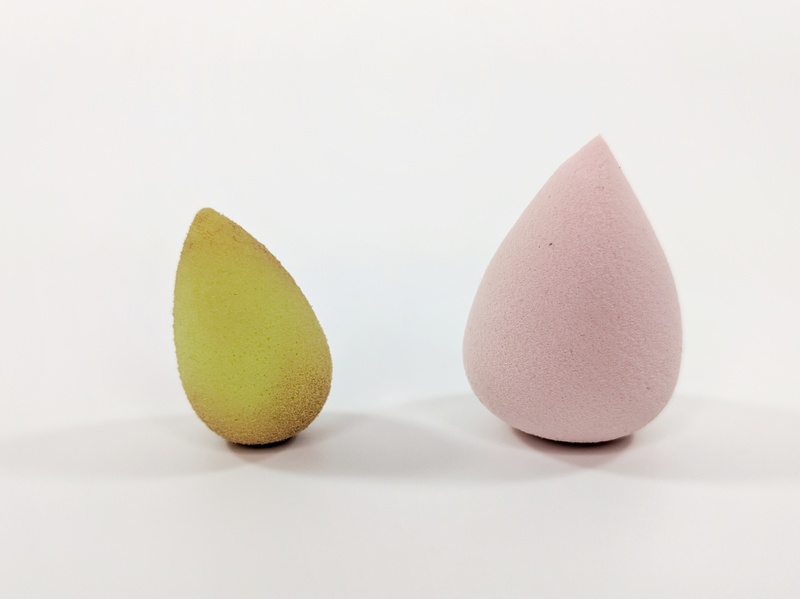 This little mini blending sponge is so cute! It’s a great size to use around the eye area. I’ve pictured it next to the Beauty Blender Micro Mini to give you an idea of the size (please excuse the grossness, I didn’t feel like washing it and letting it dry before the picture). Compared to that one, it’s more firm and bouncy. And it’s pink! 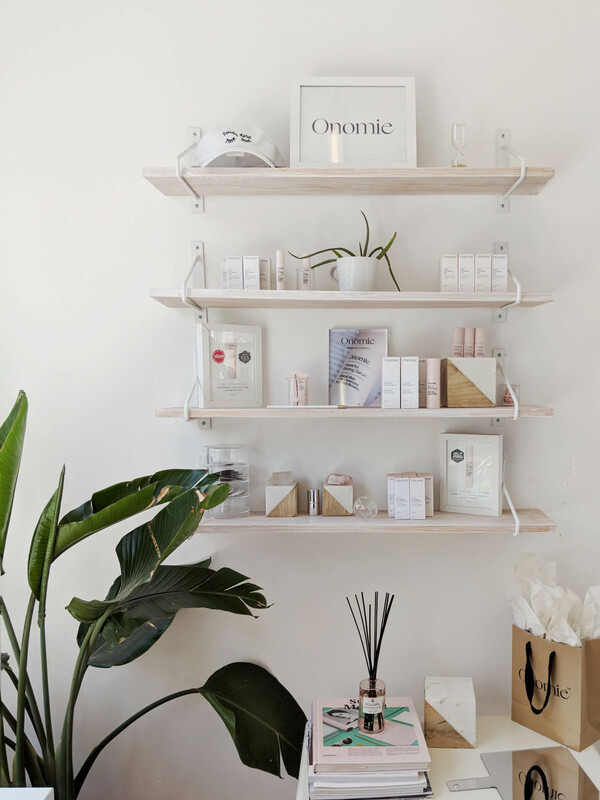 In Short: I’m really pleased with every product in Onomie’s line, and I can’t wait to see what they come up with next! I may have to invest in that primer!! Also, companies are really stepping up their game, this company’s packaging is sooooo goood! AND look at those cute blending brushes! Need it!!! Yaaas, no one should ever have to sacrifice skin care for fabulous make-up! I hope the trend of combining the two continues, so you never have to feel bad about looking good. So happy that companies are taking care of their customers’ skin! Your posts are always so informative – I love reading them! I need to check out that sponge! I want one but don’t want to spend so much $$ on a beauty blender. Multi tasking and skin care are best when paired together!